Drupal 8 has garnered significant community support over the last year. Many of our favorite Drupal 7 contributed modules now have stable Drupal 8 releases, making the transition to Drupal 8 a smoother and beneficial decision for many organizations. As the spring of 2017 ended, Google search traffic for Drupal 8 also surpassed that of Drupal 7. Certainly not definitive, but another telling clue for those considering transitioning to the latest release. 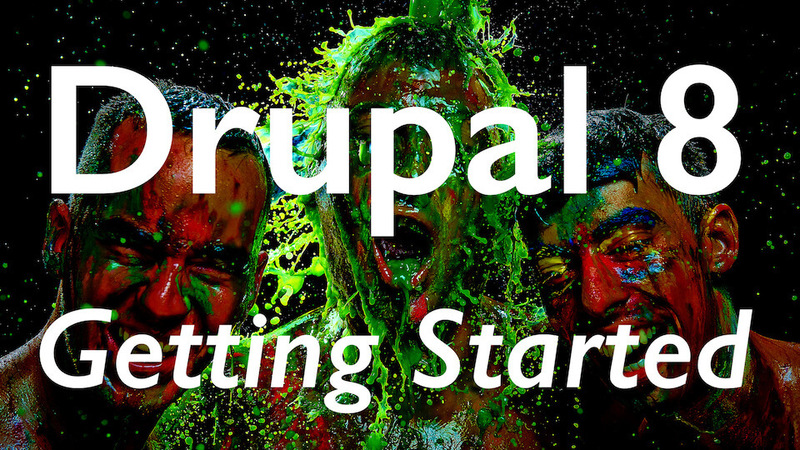 Let's get started with Drupal 8 basics by performing the core install. Then, we'll setup a single community contributed module. As a team, Daymuse uses Acquia Dev Desktop to manage our local development environments. That's what I'd recommend you do as well. The software is simple to install. It automates several installation and management processes. It'll keep up with repository updates so you can quickly create Drupal sites with the latest distributions available. It also provides integration with Acquia enterprise services. This tutorial will proceed from the point of having Acquia Dev Desktop installed, working from Mac OS. Let's create our first Drupal 8 install on our local workstation with Acquia Dev Desktop. This will begin the file download and installation process of Drupal 8. This will send you over to your web browser to complete the configuration. Follow the prompts: select language, your install profile (Standard generally), confirm your system meets requirements, let Drupal configure a new database, and finally configure the site. This information can be changed later. Don't worry about having a great site name or ideal email address just yet. Once this process completes, you should wind up logged into your new Drupal 8 site. If you've had any trouble working through these initial Drupal 8 core steps, feel free to reach out to me on Twitter @chrisrcooper. Once you've poked around your install, which should look surprisingly like our generally recommended admin design for Drupal 7, let's begin the process of installing a contributed module. Composer is now installed on your workstation, available throughout Bash, and configured to work with Drupal 8 repositories. Let's use Composer to quickly install Simple FB Connect and all of its various dependencies. As you can see from the results, Composer did a lot of heavy lifting in installing various external dependencies that Simple FB Connect has. Phew! Take a break. Now, let's enable and configure the Simple FB Connect module in our Drupal 8 installation. Confirm that the Simple FB Connect module permissions are configured correctly on the Permissions page (/admin/people/permissions). Now you will need to configure Simple FB Connect's module configuration options. Our Drupal 7 tutorial for Simple FB Connect walked through the process of creating a Facebook App which is required for this module to connect to. The process hasn't changed. You can follow the Create Facebook App portion of the old tutorial if you don't already have a Facebook App to use. Once you've setup a Facebook App, you can use the credentials to fill out the module configuration. You'll want to allow Visitors (anonymous users) to login with their Facebook accounts in order to test the module and your Facebook app. Enable Visitors for Registration and Cancelation on the Account Settings page (/admin/config/people/accounts). Visit the login page from a fresh browser. Attempt to login with your own Facebook account. Once you've entered your Facebook login info, if you're successful, you should see your account logged into the Drupal site with your Facebook account name. Congratulations! You've setup a development environment compatible with Drupal 8, Drupal 8 itself, and a contributed module to extend the capabilities of the CMS. You've also setup Composer which will be a useful tool as you work with other complicated PHP projects or Drupal contributed modules. The primary reason you're integrating Facebook's login system is to improve the user experience. You may need to manually prune your user accounts for spam, but it may be worth it to continue to allow users to login (and register) with their Facebook accounts without approval. If a user has to wait for manual administrator approval, they may never bother to return once you've approved them. If you're interested in thoroughly integrating Facebook with your Drupal website strategy through professional services, reach out. Think this tutorial is useful? Don't forget to share!